The highest ranked Indian in golf, Jeev has moved from a European ranking of 104 to 48 - the first Indian ever to do so. Besides winning the pro Asia tournament in Bangkok this year, Jeev played exceptionally well in the Dunhill Open and the South African Open. His aim is - "I want to win British Open and the U.S. Masters." For celebrity sons it has often been a Hobson's choice. A one-way road to whatever they want to be, only one pair of shoes at the start of the road for them to slip into, which usually belongs to their fathers. Many accept this as ordained and pick up their father's tracks. 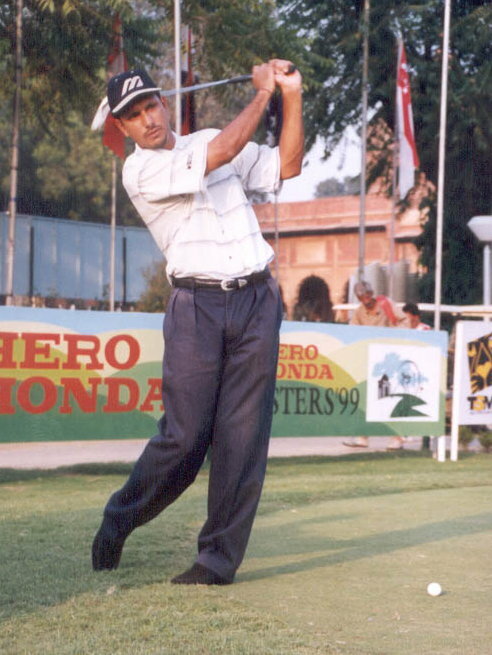 Others like Jeev Milkha Singh go their own way and try and match up to the calibre of their fathers. Jeev has had two people to match up to---his father, the great Milkha Singh and his mother, Nirmal Kaur who too was the former captain of the Indian volleyball team. 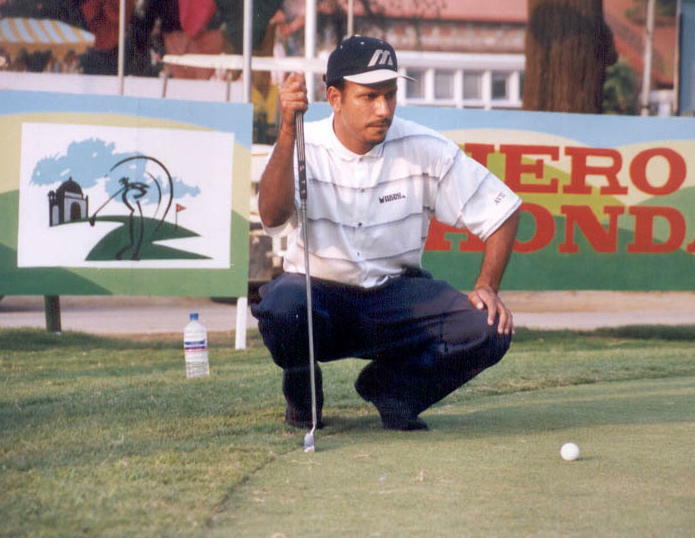 Jeev Milkha Singh wants to earn the same respect in the sporting arena as his celebrity parents. And he is nearly there. As India's best golfer he is moving from strength to strength. Jeev's career has seen a steep ascent in the last three years. From a European ranking of 104 he has climbed to the 48th. position---the first Indian ever to do so. A graduate in golf from the U.S., Jeev sees a steady rise in popularity of the sport in India. "What we need are academies and colleges which tap talent and professionally train young people. Only then will we get world class champions." Do you attribute part of your success in golf to your father Milkha Singh? A: Of course it has been a big advantage. Everyone knows my father, the 'Flying Sikh' of the sixties. But there may be some who don't know that my mother Nirmal Kaur too is the former captain of the Indian volleyball team. Thus a sporting career came naturally to me. I could say that I was born in a household, which breathed and dreamt only of sports. That was my greatest advantage. How come you never opted for either athletics or volleyball? A: To tell you the truth I wanted to play a game that I could keep playing till the age of 60 or 70. No sport except golf allows you such luxury. An athlete's career is usually over before he is 30. So, from the very beginning I decided that golf was going to be my game. When did the golf bug bite you? A: I don't exactly remember. It must have been when I was around nine or ten years of age. That was the time I seriously got attracted to it and would closely observe senior army officers play the game. Was your father disappointed that you weren't following in his footsteps? A: On the contrary he was ecstatic when he heard I wanted to play golf. In fact he was so supportive of my decision that he would take me daily to the practice sessions which gradually started extending for hours. He stood by me like a rock. Given his experience in sports did he give you any advice? A: Only one. When I told him of my decision to play golf he said he was very happy as long as I aspired to excel in the game. He told me to try and be the best golfer in the world. I can never forget his words...' Let not people say you are Milkha's son. Let them say I am Jeev's father.' Can any young person aspire for more in terms of motivation? What was his reaction when you won the tournament? A: My father was beyond himself with happiness when at 13 I won the first amateur tournament - American Express Championship in Delhi. He has always been around. He was there to give me a bear-hug when I won the first pro-tournament in Malaysia. How is it that you are the first Indian to win pro tournaments in Asia and others have not. Is it because of a lack of talent or something else? A: I don't think there's any dearth of golfing talent in India. And as far as winning tournaments is concerned I can only talk about myself. Winning doesn't come cheaply. There's a big price to pay in terms of hard work. Believe me I practice over eight hours every day. No Sundays. No holidays. Plus I have the unflinching support of my parents. Do you feel that the Asian level of play matches that of West? A: Golf is becoming very popular in Asia. Consider this....a few years back there was no organised tour in Asia. But now with the Asian PGA tour we are all on a surer footing. Playing conditions too have improved considerably and thanks to television, the exposure is widespread. The Asian PGA tour will definitely boost the morale of the Asian golfers. In a country like India where cricket is worshipped, do you see golf achieving any level of popularity? A: Yes, in the next decade golf will become as popular as cricket. The media, especially the TV, is playing a big role in popularising the sport. A lot of young people who watch the game on TV have been lured to it. There is also good money in it and young people have started realising that golf can be a profession in itself and one can make a decent living out of it. How much money do you earn in a season? A: It can vary from season to season. Usually it is over $400,000. What needs to be done to popularise the sport in India? A: Academies and colleges should be set up to tap golfing talent. That is how it will gain mass popularity. But most importantly people must get an easy access to golf courses. That is one sure way of popularising the game. Which has been your most memorable tournament? A: The 1996 Asian Pro when I scored 26 under par - my best score so far. It was as if God had answered my prayers and all my hard work had paid off. Which has been the most exciting phase of your playing career? A: Winning the Pro Asia tournament this year in Bangkok after three years of hard work and the pressures of annexing this title. How do you relieve yourself from pressures of the game? A: Yogic exercises every morning relieve me of disappointments and pressures. Yoga helps me to concentrate on the golf course. Today you are ranked No.48 in the European circuit. Besides winning pro tournaments in Asia, you have done exceptionally well in the Dunhill Open and the South African Open. Do you still have any dreams left? A: Yes. I want to win British Open and the U.S. Masters. Copyright © 2002 [the-south-asian.com]. Intellectual Property. All rights reserved.